What song data can TouchCopy copy from iPod to iTunes? Which iPod song data is TouchCopy capable of copying from my iPod to iTunes? TouchCopy can copy all the iPod music metadata including Track name, Artist, Album, Composer, Last playdate, Playcount, Artwork, Comment, Genre, Rating, Year, Track Number, Track Count etc. Rest assured, none of your information will be lost, as TouchCopy performs a complete copy of each music track. You can also use TouchCopy to copy your iPod's playlists into your iTunes music library. This function will not create duplicate songs if the tracks already exist in your iTunes library. You can try TouchCopy - FREE. Just download the demo from the link below, and you'll be able to copy up to 100 music tracks. Once the tracks have been copied, right click the track in iTunes, then click "More Info". Here you'll see that TouchCopy has maintained all of the song metadata when copying to iTunes. Launch TouchCopy from the Launchpad (Mac) or Desktop (PC). Connect the device to the computer using your USB cable. Choose the music you would like to copy from your iPod, iPad or iPhone from the TouchCopy Music tab. Click the "Copy to iTunes" button. 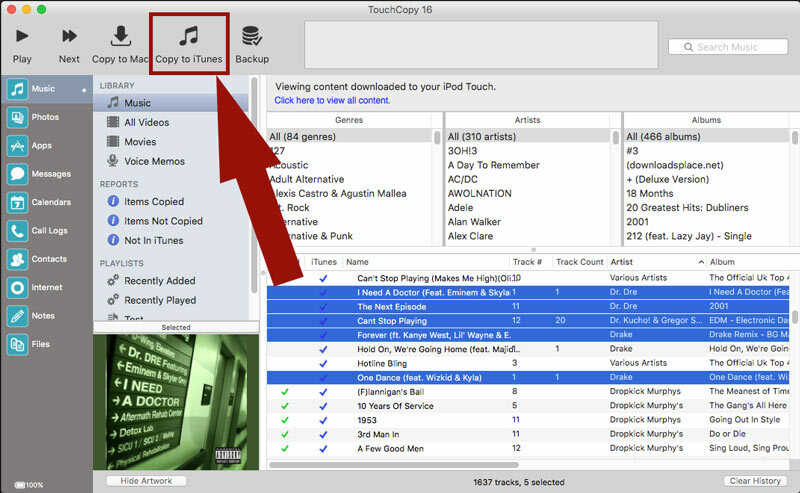 Explore our TouchCopy user guide for more information on how to copy music from iPod to iTunes. If you have incomplete, missing, or incorrect metadata on your tracks, it can leave your iTunes library messy and inaccurate. For a quick way to spot these tracks in iTunes, you can use our software - Tune Sweeper. As well as fixing track information, Tune Sweeper can also help tidy your library in other ways, including downloading missing album artwork.